The land of rising sun (as dawn breaks first in this north-eastern state in India) has few temples which have historical significance and attracts thousands of devotees on sacred days. However, Arunachal is dotted with monasteries and nunneries of various dimensions as people follow Buddhism strictly as per religious edicts. It also has some famous temples that are popular in arunachal pradesh. This is the second largest monastery in the world after the Potala Palace in Lhasa, Tibet. 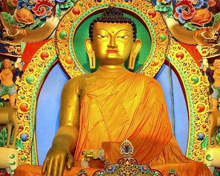 It was built near the small town Tawang in the north western part of Arunachal by Merak Lama Lodre Gyatso in 1680-81 in accordance with the wishes of the 5th Dalai Lama Ngawang Lobsang Gyatso. The monastery belongs to the Gelug school of Mahayana Buddhism and had a religious affinity with Drepung Monastery in Lhasa which continued during the period of British rule. 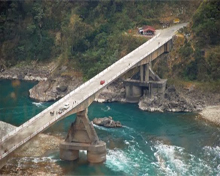 It is close to the Tibetan and Bhutan border in the valley of the Tawang-chu which continues from Tibet. The monastery is three stories high and is enclosed by a 925 feet long compound wall. Within the complex there are 65 residential buildings. The monastery is known in Tibetan as Galden Namgey Lhatse which translates to "celestial paradise in a clear night". The monastery library has valuable scriptures mainly Kangyur and Tengyur. Of all the festivals celebrated in the monastery, Torgya is the most elaborate and colourful. Located on a mountain of 3,300 metre height, the monastery has a golden statue of Lord Buddha which is about 9.3 metres high. The Gontse Gaden Rabgyel Lling monastery, popular as the GRL monastery, houses Buddhist lamas and monks at Bomdila which is 8,500 feet above sea level and known for its scenic landscape with apple orchards. 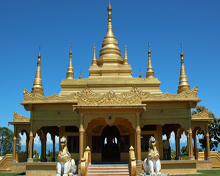 It is one of the major centres of the lamaistic faith of Mahayana Buddhism. The GRL monastery is situated in the Western Kameng district of Arunachal and was built by the 12th reincarnate of Tsona Gontse Rinpoche in 1965-66. The main gompa has three divisions -- the lower gompa, the middle gompa and the upper gompa. The upper gompa is considered to be the main monastery. While the lower gompa is situated at the end of the main market area, depicting the richness of Tibetan architecture, the middle gompa can be found at about 2 km from the main market. There is a vast prayer hall inside the lower gompa. 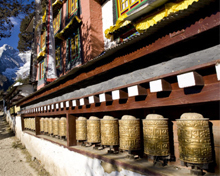 Popular belief says that ringing the bell of the gompa fulfils one's wishes. At the middle gompa, there is the Blue Medicine Buddha which is also known as the Lord of Medications, as this deity is believed to cure diseases, by the locals. People perform prayers and meditation to undergo healing. 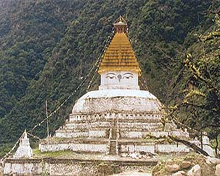 The middle gompa is the oldest of all three gompas. The upper gompa, the main part of the monastery, houses a school for the monk's children, along with a prayer hall and a Buddha temple. The upper gompa is a major tourist attraction for its peaceful Buddhist preaching. 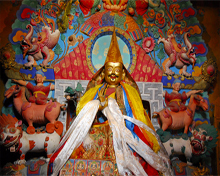 The birthplace of the sixth Dalai Lama, the Urgelling monastery is located 5 km to the south of Tawang. The monastery is surrounded by the Himalayas and the Tawang-Chu valley. This Buddhist centre for religious study traces its roots to the 15th century CE, when around 1489, it was established by Urgen Sangpo, the youngest brother of Terton Pempalingpa, the famous treasure-revealer. A home to the Buddhist monks and Lamas following the Lamaistic Mahayana school of thought, the monastery became a sacred place for the Buddhists since 1683 CE, the year when the sixth Dalai Lama Ngawang Gyamtso was born here. The monastery was restored and enlarged in the year 1699 by Desi Sangye Gyamtso. At present it has renovated structures having a double storied main temple, an assembly hall with eight pillars, an altar room with four pillars, a deities' chapel with two pillars, a residential quarter for the sixth Dalai Lama, a chapel to practice the tantric practices, Ka-Gyur house and a courtyard with twenty rooms meant for residential quarters for the monks and the lamas. The largest Chorten (stupa) of the area is the one at Gorsam near Zemithang, which is about 100-km away in the north of Tawang. Lama Pradhar, a Monpa monk, constructed it most probably in the early part of eighteenth century. The hemispherical dome rests upon a three-terraced plinth. Four miniature stupas are set on the four corners of the lower most terrace of the plinth. The base is square with each side about 170 feet in length, with a niche running all along its whole length and 120 Manis are set in frames of wood in the niche of each of the base. A paved path goes all around for the pilgrims for circumambulation. 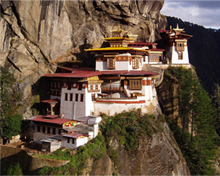 Taktsang (Tak-Tsang) Gompa or T-Gompa, 50 km from Tawang, is oneof the holiest Buddhist shrines of Arunachal. Standing amidst high mountains, its sanctity is credited to Padmasambhava, the maverick missionary who brought Buddhism to Tibet. Popular legends speak of him as a miracle-maker. When Buddhism swept over Tibet, Padmasambhava was deified as an incarnation of both Gautama Buddha and Amitabha Buddha ('Buddha of the Eternal Light'). Taktsang Gompa is among the few places in Arunachal believed to have been visited by him. The evidences of his stay can be gleaned even now from the imprints of his footsteps and the hoof prints on the rocky floor of the adjacent cave, where he meditated. Interestingly, though the holes on the floor are believed to be the hoof prints of his horse, Padmasambhava was supposedly flying on a tiger. Hence the name tak or tiger, and tsang 'place or abode'. This Gompa is situated at the heart of the Tawang township. It is believed that in the olden days the place where the present gompa stands was popularly known as "Massamg Key-ling Boothmey" which means a place where a strongman of a society used to play melodious sounds with the flutes. With the passage of time a gompa was built in that particular place. Rigyaling Gompa is situated at a distance of 1-km from Tawang township. The former Rigya Rinpoche constructed the gompa. After his death, Changsey, the secretary took charge of the gompa. The re-incarnated Rigya Rinpoche, Rev. Tenzin Tsethar is presently in South-India, completing his education. This gompa is surrounded by a thick covering of trees planted by Changsey under the guidance and supervision of forest department, Tawang. A Hindu pilgrimage centre Parasuram Kund is situated on the Brahmaputra plateau in the lower reaches of the Lohit River and 21 km north of Tezu in Lohit district of Arunachal. Dedicated to sage warrior Parasuram, the temple attracts pilgrims from Nepal, from across India and nearby states of Manipur and Assam. Over 70,000 devotees and sadhus take holy dip in its water each year on the occasion of Makar Sankranti in the month of January. A dip in the sacred pond (kund) is believed to wash away one's sins. The legend behind the belief as found in the Kalika Purana is that the Sage Parasuram washed away the sins of killing Kshatriyas in the water of Brahma kund. Parasuram was taking revenge by massacring Kshatriyas as they killed his father and wage a battle against the Brahmins. But as a Brahmin he was not supposed to wield a sword or get into the act of fighting. Dedicated to Goddess Durga, the temple located 12-km from Malinithan in West Siang district is a popular pilgrim spot for devotees across India. Sporting a classical Odisha-style of architecture, this place gets number of gifts from devotees to their Goddess for fulfillingtheir wishes. Prayers are recited at the sanctum pleading for happiness to the families. According to Kalika Purana (8th century), Lord Shiva roamed in the sky with the dead body of His consort Parvati. To bring him out of attachment for the dead body, Lord Vishnu using his 'Sudarshan Chakra' cut the body into pieces. During this process, it is said that one of the body piece fell on a spot which is 12-km from Malinithan towards Along in West Siang district. This place is called Akashi Ganga and is very popular as a sacred place. There is a temple near the road. From there one has to go 100 meters down through a spiral path, where a sparkling object can be seen in the kund. But on going further down the object turns invisible. The devotees take bath in this kund. The place offers a scenic bird's eye view of the Brahmaputra river flowing in sparkling glow far below. 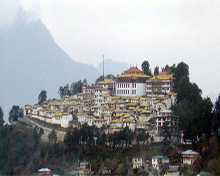 Tawang district has a long tradition of nunneries called "AniGompas", which are the abode of nuns. Unlike the monks (Lamas), the girls become nuns and join the nunnery on their own and there is no social pressure or tradition making the practice compulsory. Brama Dung Chung Ani Gompa (nunnery) is the oldest Ani gompa (nunnery) in Tawang district. It is situated in the lap of a far off mountain laced with natural scenery and just 9-km from the main town. 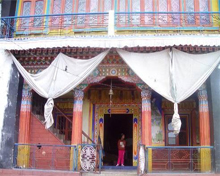 This nunnery was constructed by a Lama named Karchen Yeshi Gelek from Tsang province of Tibet in 1595 CE. Presently there are forty five ('Anis') nuns in this Monastery. Being very poor, the inhabitants of Brahmadungchung Ani Gompa depend on begging for sustaining themselves. Gyangong Ani Gonpa is a beautiful nunnery having about 50 Buddhist nuns, located on top of a hillock about 5-km away in the north of Tawang founded by Mera Lam Lodre Gyamtso and was subsequently offered by him to his elder sister. Thus the Gyangong Ani gompa came into existence. This Ani Gompa is under the administration of Tawang Monastery and the nuns of this monastery get provision from the Tawang monastery. The location of nunnery and the customs being followed by nunsremind visitors of the period of Maurya Dynasty, when the Buddhism was preached in remote hilly areas under the shade of green trees. This Gompa is situated at a distance of around 28-km west from the Tawang headquarters towards the Geshila road. It houses around 30 anis and the new Singsur Anie Gompa was built by the previous Rev Gonpatse Rinpoche in 1960. The old Singsur Ani Gompa is also in existence and is situated in the midst of the 'Shaa' (huts) of the anies.